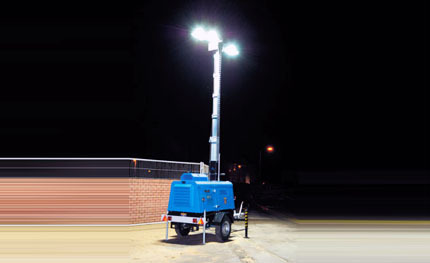 SEVEN STAR POWER Generators hiring super silent diesel tower and globe lights.Their compact design allows quick deployment in confined spaces to provide temporary lighting to the surrounding area. Each tower light contains 4 x 400W Metal Halide lamps, which provide an intense white light. The integral winch up stand mounted on the trailer unit can raise the lamps to around 3 metres above the ground. Globe lights contain either a 1Kw or 2Kw Metal Halide lamp, and illuminate an inflated "globe" supported 6 metres in the air. Each Tower light unit can also provide a secondary power supply to a nearby stall, marquee or security tent via additional outlets on the generator. They can also power a 'slave' tower nearby, doubling the available light if required.